Home>Music> Wale Joins "Go-Go" Preservation Protests In Washington D.C. In Washington, D.C. a local "Go-Go" concert put on by Justin Johnson in less than 24 hours turned into a protest over the subgenre's ongoing conservation efforts. For those that don't know, Go-Go isn't just something DC rap artists like Wale, etc. have drawn inspiration from in an indirect manner or something that gives them a foothold vis-a-vis local fans. The Go-Go scene operates independently, without the prodding of a bigger entity. The problem is that over time (since the late 60s) interest in the funk-driven subgenre specific to the region, is dwindling at an alarming rate - tantamount to local demand and the modern means of consumption undertaken by the iPod generation. Unlike in the field of hip-hop, where producers face a less-demanding learning curve coming out the gate - whereas taking on a live instrument is a more arduous and learned process unless of course, the Go-Go bandleader places you on eternal cowbell duty. Which brings us to the concert turned protest that took place in the at 7th Street and Florida Avenue. Had it not been for a noise complaint from a neighboring store in the district, Justin Johnson and the musicians he assembled might have never taken the fight to the ground level. Before long, a crowd had emerged in support of their protests, within the very same intersection. One of the notable figures to lend his voice was none other than Wale, a righteous DC-native who's used his elevated platform to spread the good word on Go-Go in the past. His 2010 collaboration with Gucci Mane called "Pretty Girls" is unmistakably a "Go-Go" record, as the song's rhythm section performed in part by Weensey of Washington's Backyard Band, is pretty hard to dismiss as a modern entry to the subgenre's musical canon. 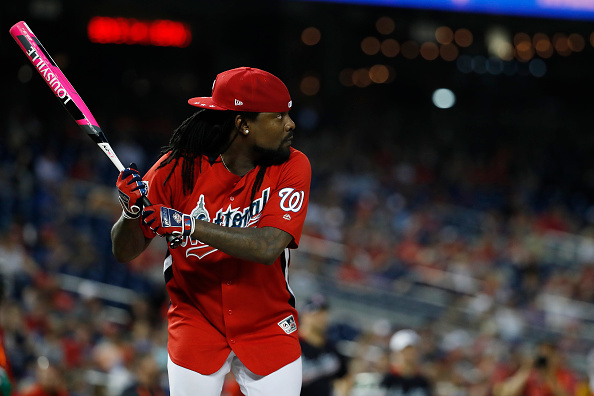 Wale spoke with local ABC outlet WJLA about the importance of Justin Johnson's conservation efforts not too long after he'd made his presence felt at the aforementioned intersection. "[Go-go music] made me the man that I am today, and I will never let it go and I'm going to do whatever I can to keep that tradition alive," Wale spoke confidently. After speaking with Wale, the WJLA news crew turned their attention to a host of other prominent figures such as Flex Cartel and Biggs Cooley, two of the many local rappers who make a concerted effort to work with Go-Go musicians, at whatever cost. MUSIC Wale Joins "Go-Go" Preservation Protests In Washington D.C.